Check out our building progress! A look northwest from College Street. Looking southwest from location of parking lot. The south end of our second floor fitness area. Our new aquatics center is taking shape! Click to watch a fun time-lapse video of progress to date! Attendees signed the highest BEAM before it was lifted into place. More than 70 people posed with the BEAM. Y President and CEO Kyle Dodson thanked everyone who has brought the project to its highest BEAM. Mayor Miro Weinberger, well, BEAMED. Workers guided the BEAM into place. And the flags waved in the BEAMING sunlight. The building continues to take shape as the work to erect the steel frame moves northward to the central portion. The foundation was completed and steel is on its way up! 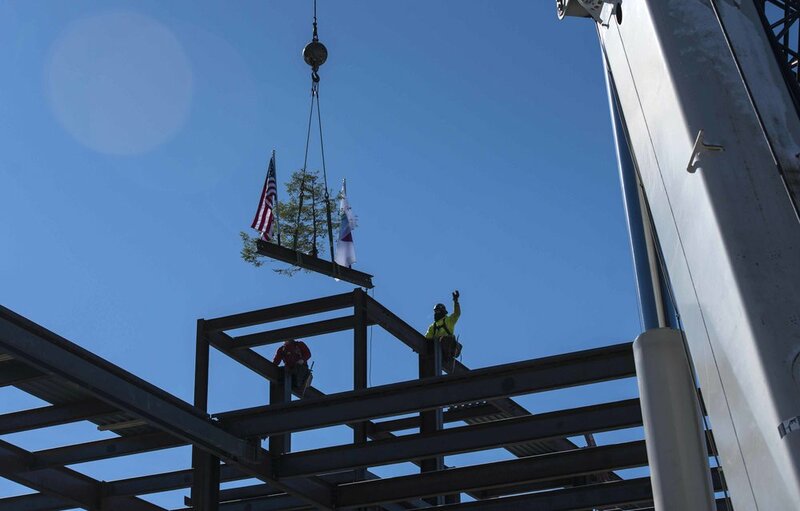 We anticipate "topping off"--reaching the highest point of steel--in March. Crews quickly laid the foundation for the pools facing College Street and began moving toward Bradley Street to complete the foundation of the child care wing of the new building. Our "Groundbroken" ceremony on November 1 brought out a celebratory crowd. "The Y is a community crossroads," said President & CEO Kyle Dodson. "We're weaving the threads of our community together." Crews got a head start preparing the site and laying the foundation before winter weather set in. Demolition went quickly, thanks to great preparation, dedicated crews, and rain that kept the dust down. "With a new building, the Y can move families off the child care waitlist—so more families can experience the joy, security, and sense of community we enjoy."